Today was the last day at work for one of my colleagues whose desk is right outside the door to my office. She’s moving on to a new job, one that she hopes will bring her fresh challenges and a chance to continue to grow and develop in her professional career. I’ll call her Holly Hockey, because she is one of the most rabid hockey fans you can possibly imagine. When the NHL had one of its recent strikes and time passed without a resolution, she became increasingly agitated at the thought of a winter without hockey, and you could hear her spluttering about how it was high time to settle this thing and drop the damned puck! Ask her about how she thought the Columbus Blue Jackets were doing, and you’d get a thoughtful and comprehensive analysis of the rising stars, the disappointments, and some likely personnel changes. But hockey is just one of the things that HH is passionate about: other key interests included her family, Dropkick Murphys, Irish heritage, avoiding painful sunburns, and a nice glass of Jameson’s to help reflect on a week of work well done. She is one of those “glue guys” — people who help to make any workplace work just a bit better, by being willing to pitch in and help even when it wasn’t technically her duty to do so, by being a friendly face when you got off the elevator, and by laughing at your lame attempt at humor or sharing her ditty about the perils of drinking tequila (“One tequila, two tequila, three tequila, floor.”) Over the years we got to know each other and could share a chuckle on a tough work day. She put up with my guff, and I appreciated it. You don’t quite fully realize the value and impact of such people until they are gone. We all touch each other in different ways, without really thinking much about it. HH was one of those people who touched her lucky co-workers in a good way. We’ll miss her, but we can’t help but wish her the best as she moves on to tackle a new job. Now if only the Blue Jackets would start hitting and playing some old-fashioned hockey! Tonight the National Hockey League playoffs begin! Throughout the land, the sense of excitement and anticipation is palpable. But there is no joy in Mudville — er, Columbus — because the Blue Jackets have once again fallen short. They and their fans are sitting on the sidelines, watching as the ridiculously protracted NHL playoff process gets underway without them. 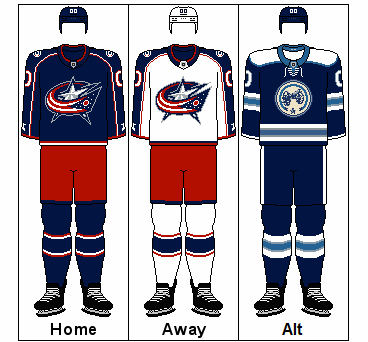 The Blue Jackets have been in existence for 10 years. During that time, they made the playoffs once, and were promptly bounced out. This record of futility is a kind of perverse accomplishment, because in the 30-team NHL 16 teams — that is, more than half — make the playoffs. To miss the playoffs year after year takes some doing. I don’t know anything about hockey and don’t follow the sport, so I can’t offer even the kind of banal second-guessing that is the stock in trade of most sports fans. It just seems like the Blue Jackets are snake bit, and once a team gets that kind of rep it is tough to dispel it. As a Cleveland sports fan, I’m used to this kind of dismal performance, but I do feel badly for the Blue Jackets and their fans as they sit back, crack open a Molson’s lager, and wait until next year. The Crew won the MLS Cup a few years ago, but the Blue Jackets have been a kind of Sad Sack team. The made the playoffs one year and quickly were eliminated. Other than that, their record has been abysmal. In most years, they have been virtually eliminated from the playoff hunt by the beginning of January, and the hardy souls who buy season tickets are begging their friends to use the ducats thereafter. This year is different. The Jackets have a new coach, are playing a new style of hockey, and have started the season 13-6, including a stellar 7-1 record on the road. The team has a good corps of young players, including star scorer Rick Nash, and two good goalies in Mathieu Garon and Steve Mason. While the season is still young, there is hope in Columbus that the franchise may have turned the corner. The question for hockey fans is whether the CBJ could be one of the NHL’s better teams, capable of playing deep into the playoffs — something that would be good for Columbus and great for the franchise. We may learn the answer soon enough to the question about how good the Blue Jackets really are. On Friday the perennial NHL power, the Detroit Red Wings, visit Nationwide Arena for a key divisional contest.